Wakefield Trinity Wildcats outside back Richard Owen has voluntarily agreed to enter a rehabilitation programme with the Sporting Chance Clinic. A statement released by the Wildcats said: “The club applauds Richard’s initiative in this decision and the club will continue to fully support Richard throughout this process. “In order to allow Richard to focus upon his recovery, the club has agreed that Richard will be made unavailable for selection for the foreseeable future. “The club would like to thank Sporting Chance and the RFL for the opportunity afforded to Richard to undertake such specialist treatment. “We would ask that all supporters and members of the press respect Richard’s privacy during this very important time. 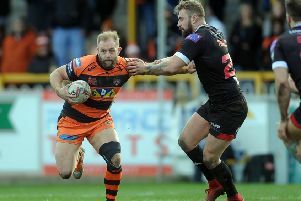 Owen, who joined Trinity from local rivals Castleford Tigers in 2014, has made 16 appearances for Wildcats this season. Founded by former Arsenal and England footballer Tony Adams, Sporting Chance is a centre for the treatment of behavioural problems among professional and amateur sports people.